The Tropical Weather Outlook, issued 4 times a day, will include categorical probabilities of storm development: Low (less than 30%), Medium (30-50%), High (over 50%). The Saffir-Simpson scale traditionally used to classify hurricane strength will be modified on an experimental basis to exclude storm surge and flooding indications. The reason for doing this is that the Saffir-Simpson scale is primarily a measure of maximum wind speed, but storm surge is affected by several other factors, such as storm size and forward speed, shape of coastline, and water depth. For example, Hurricane Ike last year made landfall as a Category 2 storm, but the storm surge was comparable to what is currently defined as a Category 4-5 storm. Emergency management officials reported that many residents refused to evacuate since the storm was "only" a Category 2 or 3 as it approached land. Likewise, Katrina (2005) had Category 3 winds at landfall, but the storm surge was equivalent to Category 5. On the other hand, Hurricane Charley (2004) had Category 4 winds but only Category 2 storm surge. The Atlantic season will begin in 2 weeks, on June 1. CapitalClimate provides a number of links to national, local, and international tropical storm information in the list to the left titled "Tropical Topics". Discussions of significant storms will be provided in blog posts as appropriate during the hurricane season. Image: Eastern Pacific Tropical Outlook from National Hurricane Center. The National Climatic Data Center's preliminary analysis released today shows that global temperatures for April 2009 were the 5th warmest on record. This makes April somewhat warmer relative to average than March. For the January-April period, temperatures were tied with 2003 as the 6th warmest. The warmest regions relative to average were Mexico, the northeastern U.S., southern South America, and most of Europe and Asia. Areas with cooler than average temperatures were north central to southeastern U.S. and western Asia. For the contiguous United States overall, the average temperature was "51.2°F (10.7°C), which was 0.8°F (0.5°C) below the 20th century mean and ranked as the 36th coolest April on record, based on preliminary data." Regionally, much of the country had near average temperatures, but the West North Central region was cooler than average. The Northeast was warmer; New Hampshire had its 8th warmest April in records dating back to 1895. NOAA's Residential Energy Demand Temperature Index indicates that energy demand due to temperature was 2.3% below average. The Australian Bureau of Meteorology reports that a sharp cold outbreak in the final week of the month set several record lows. The reading of -13.0°C (8.6°F) on April 29 at Charlotte Pass was a new record minimum temperature for all of Australia in April. An April record for the state of Victoria of -8.2°C (17.2°F) was set at Mount Hotham. For the country as a whole, however, Australia was "slightly warmer and drier than average" in April. Although temperatures were near or below average in the population centers of the southeast, they were generally above normal elsewhere. In the UK, the Met Office reports that monthly temperatures were above average across the whole country, "ranging from about 1.3°C above in south-west England and south Wales to about 2.3°C above in East Anglia, south-east England and northern Scotland. 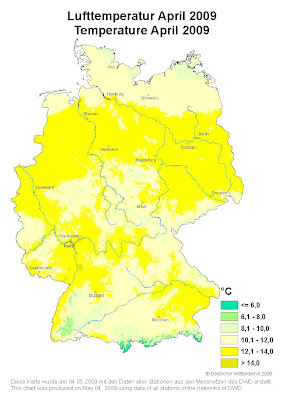 The warmth extended to northern Europe, where Deutscher Wetterdienst announced that the monthly temperature for Germany of 11.8°C in April was 4.5° above average. This made April 2009 the warmest April in records dating back to 1891. Average sunshine was 62.5% above normal, making this the second sunniest April after 1951.